We have a lot of yarn hanging around the house. I feel that we might as well put it to use. 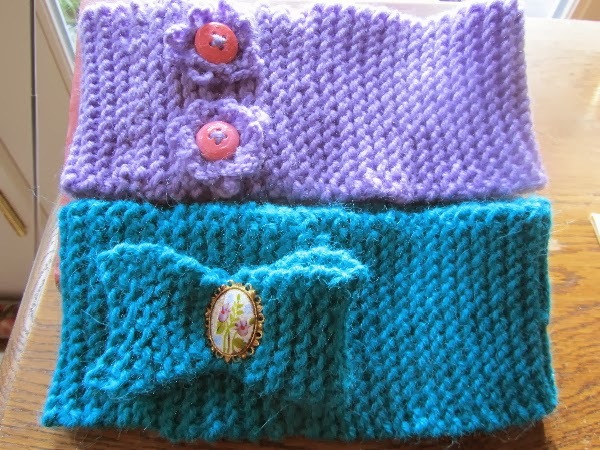 I made knit headbands for each daughter, using this leftover yarn, some wooden buttons and paint, and a small choker charm from my own girlhood (remember the 70s and chokers?). One headband takes about a half ball of yarn. I knit these in the garter stitch (knit on both sides), and doubled up the yarns to make the headbands thicker, and knit faster. And lest you think I must knit quickly or well, let me tell you, this is definitely a beginner's project. I knit like a 6 year old! One daughter keeps telling me that someday she'll teach me how to knit like a grown woman. But these turned out pretty nicely, and didn't take too many afternoons of work (an experienced knitter could probably crank these out in 2 to 3 hours). After sewing the bands into loops, I added some trim to each -- a knit bow with a center made from a piece of my girlhood jewelry (a china "cameo"that I stitched to the bow), and two doubled crochet flowers, with button "centers" (the buttons are wood ones that I painted with acrylic paints). These projects were made entirely from materials that I had on hand, which makes me happy. You know how it is. If you knit, leftover yarn seems to fill the corners of the house. Busy days! What do you like best -- making or buying gifts? I think I find fun in both activities. I was out shopping on Friday, and really enjoyed the "choosing" part. But I also take pride in the things that I make. A woman at church was wearing one like this; it had a peacock feather attached and some other things I couldn't see well on the feather; it looked like a 1920's flapper headband. It was very pretty and I really liked it. My husband pointed it out to me and asked if I liked it. I wish I had seen the detail better but it was like a hat embellishment. Thank you. Now I want to make one for myself. I'll have to go through our stash of yarn to see what I like best for myself. Good job making smaller stockings. They will be much more manageable for you, and still lots of fun for the children. With filling the stockings, I go by the Little House on the Prairie description of stockings, how Laura looked at her stocking and could see that there was something in it, not necessarily overflowing out the top. Those ginormous stockings that you see in stores now are ridiculous, and greed-inducing, IMO. Thank you, Tigersmom! And they were fun to make! We didn't even do stockings till a couple of years ago (at the kid's request). Ours don't seem to be overly huge. I love the headwarmers! A knitting friend of mine sent me a pattern to make one but I haven't tried circular needles yet. It's my kind of project--quick, simple, with a good likelihood of success. And a good stash-buster! (another knitting friend from church has given me lots of her yarn stash. I like buying gifts and making gifts if I'm not feeling rushed. The sense of "I have to get this done now" takes the fun out of it for me. If I feel like I've made or purchased something that will be a big hit, it's a great feeling. I knit these on straight needles. They knit like small scarves, then sew together. The most time-consuming part seemed to be finding out how many stitches to cast on. I settled on about 16 stitches to have a band about 3 inches in diameter. Chunkier yarn would require fewer stitches and use larger needles. One of my yarns was quite fine, so I tripled the yarn so that it would knit quickly, make a thicker band (warmer) and be more like the first that I made. I know, I don't like the "I have to get this thing done" feeling either. A couple of years ago I knit almost everyone on my list a scarf, and I burned out so badly that I didn't knit for 2 years after that. I only choose really manageable projects now. If I get into a more time-consuming one, I'll usually abandon it or modify it to something simple. What size needles? And have you checked out Ravelry? It's a website for knitting/crocheting. Many people post free patterns on there. I tried posting my finished projects on there but it just seemed like more work--I'm more interested in the ideas aspect of it. They have many cute, easy ideas (small toys for kids, tree ornaments, etc.). I knitted a beard for my son's Halloween costume based on a pattern I saw there. Size 9 needles, Kris. I have yet to check out Ravelry, but will when I have more time. I'd like all the ideas, too! How clever to knit a beard! How did you knit the bow? Will you write a tutorial on making these headbands? I love them, BTW. the bow is simply a small, long narrow rectangle (like a doll scarf). I sewed the ends together on the backside, making a loop. Then I ran yarn through both layers of the loop, from one side to the other, and gathered the yarn tightly and tied off. This brought the center of the bow in enough to resemble a bow. Not really a tutorial, as these are so simple to make, but I'll write up something to help you make one for yourself, if you like. As I make one for myself, I'll take measurements and such and post them. I heard the other day that the average amount spent on filling a Christmas stocking is $50. That seemed like a lot to me. But then again, when I see something suggested as a stocking stuffer on TV, it's usually something I would give as a main gift. I don't think of myself as cheap, but compared to a lot of people out there, I guess I am. BTW, wish I knew someone to make these headbands for. Just the kind of small project I like. $50 per stocking just sounds ridiculous, especially for children. But if my husband wanted to put a piece of jewelry into a stocking for me, I wouldn't object! $50 is more along the lines of main gifts for us, too. I wouldn't say that you're cheap, more along the lines of sensible, but living in an unsensible society. The nature of gifts has changed as well as the amount spent. 150 years ago, parents gave their children needed items. Now, to give your kids socks just sounds mean to a lot of parents. These are so cute! Yes, a tutorial with measurements would be wonderful! Those are so cute, you may have stumbled on a way to make some extra income from home as well if these sell for $15. I like making gifts more than buying them, and enjoy receiving handmade gifts more than store bought gifts as well. There is just something extra special knowing time and thought went into the gift. Thank you. I feel the same way about receiving hand-made gifts. They mean so much to me. Wishing you a lovely Christmas with your family! Our stockings are quite small and my mum used to complain about finding things small enough to fit into them (but we always got chocolate money). I love both making and buying presents. I make most of mine, but will buy something if I know the person will love it. This year I got my sister a cheap ice cream maker because she liked mine so much. Also, I agree with Living Simply Free, if those headbands are selling for $15, you should start a shop! I bet that your sister will love the ice cream maker. It will be fun for her to use, but also remind her of her visit to your city. The stocking that I had, growing up, was really pretty small too, just enough room for some candy and gum, and one or two small items, like hair barrettes, or a small piece of costume jewelry. I'm not sure that I can knit fast enough to make more than $1 per hour, if I sold knit headbands, but it is a possibility. This is such a great idea! Looking forward to making these for my nieces. Thanks! If your nieces are anything like my daughters, they will love them!